Hotel Aldebaran , 3 stars in Riccione, with swimming pool on the beach, parking and garage on request, WI-FI internet connection. Accepts small pets. The Hotel Aldebaran enjoys a privileged position, in an internal and silent street, but a few meters from the sea and Viale Ceccarini, the center of Riccione, where there are boutiques, trendy shops and the most popular restaurants. All rooms are equipped with large terrace, independent air conditioning, WI-FI, direct dial telephone, safe, wake up service, 22 "LED TV with digital terrestrial, private bathroom with shower and hairdryer, breakfast can be requested in your room. The hotel has a garden, a lift, a bar open 24 hours a day, a reading room with newspapers, free bicycles, laundry and beach towels (both on request). Theme nights are organized. PARKING: uncovered and garage (both on request). SERVICES FOR DISABLED: entrance located on the ground floor. BREAKFAST: sweet and savory with homemade desserts. LUNCH AND DINNER: 3 choice menu (meat, fish, vegetarian), vegetable buffet, side dishes, fresh fruit and desserts. Pasta and desserts are homemade. In the hotel: strollers. Pediatrician and baby sitter (both on request). At meals: baby food , baby food, baby menu, high chairs. On the beach: children's pool, entertainment, playground, recognition bracelet. 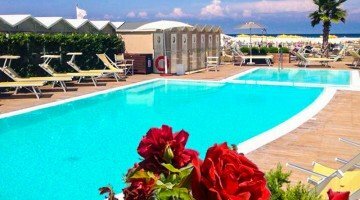 The beah affiliated with the hotel Riccione Beach 72 offers many services, rental tents and beach umbrella, hot and cold showers, playground, entertainment, bar area, playgrounds, changing table and a braccialettino recognition for children. Hotel guests can also take advantage of the heated salt water pool and hydromassage at the plant n. 70. The offer refers to a 1 week stay at a cost of € 392.00 per person. The offer refers to a 1 week stay at a cost of € 413.00 per person.